Whilst I'm sunning myself on the beaches on Vietnam, back in the UK you must all be snuggling up to the fire, wrapped up in your woolens or maybe even splashing about in your wellies (sorry, did I go to far)? OK so enough of the gloating, I just wanted to give you all a mental picture and cast your minds forward to the myriad of style possibilities awaiting us in SS'2012. 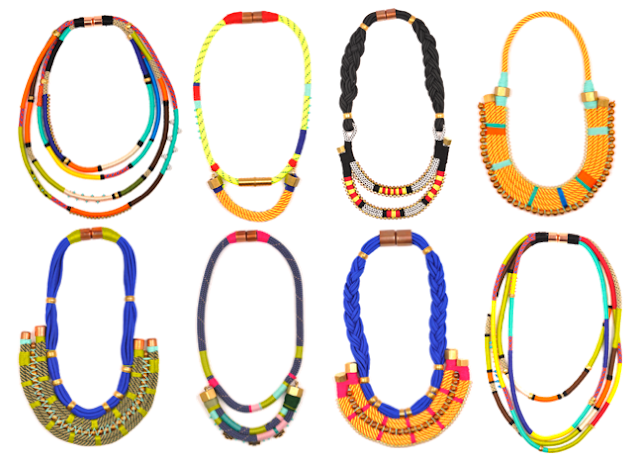 Take these Holst + Lee beauties for example, what more could and ethnic style junkie want of a summer accessory than vividly coloured, oversized, tribal-inspired statement jewellery? Can't think of a thing. Hailing from the beautiful south (of the USA that is), designers Natalie Holst and Rochelle Lee met whilst working in the NY nightclub scene, of all places. Naturally the pair are flaunting their jewellery line all over New York right now, having accessorised runway collections for designers Yigal Azrouel and Mara Hoffman. I'll definitely be adding these to my SS'2012 wishlist (emphasis on the plural).